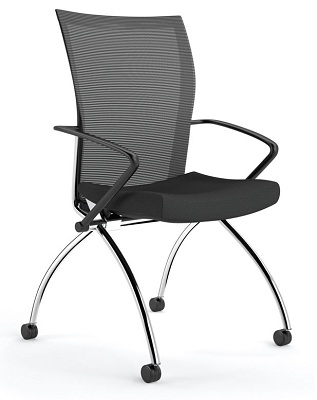 The Valor Training Series High Back Chair has integrated arms that are 25" high. It has a 250 lbs. rating. It has a comfortable mesh and fabric combo with a synchro-tilt movement. The seats flip allowing for compact, nesting storage. It is CA117 approved. It has chrome legs, and dual-hooded casters. Shipped Assembled, 2 per box. The Seat Height is 18 1/2"
The Seat Height is 18 1/2"